Copenhagen tradeshow CIFF (30 jan-1 Feb.) concluded its FW19 edition on Friday night. The show’s perennial ‘special project’ is always the first thing to greet visitors as they enter the vast Bella Center venue. This time, the third and final part of the Northwind Trilogy was unveiled – an experimental, multifaceted work by Bahamian-born artist Tavares Strachan. Commenting on the industry’s sustainability and social responsibility, the work featured six bomber-style jackets produced using various craft methods in ethical workshops across the Bahamas. The immersive work also encompassed video installations, sculptural works and photographs documenting the artist’s training as a cosmonaut. Next, we explored Raven, the CIFF section dedicated to young, progressive designers from near and far. Though some Scandinavian buyers we spoke to questioned the showcase’s commercial relevance, it never fails to inspire us, particularly since most designers present their wares in installation-like set-ups. To get an idea, see the lead image above, depicting London designer 3.Paradis’ work. Monkee Genes founder Phil Wildbore had returned to the show with his brand after a three-season hiatus: “We decided to return as we now have a Scandinavian agent, which is absolutely essential in this region. We’ve had visits from all the big stores and e-tailers, but would have liked to see more indies – the few that are still around seem to have become a rare species at tradeshows in general. Let’s hope this trend reverses,” said Wildbore. CIFF news for the upcoming SS20 edition in August 2019 includes a dedicated ‘sport’ section – further details on this initiative will follow. In a bid to boost its international exposure, CIFF will bring a taster-showcase to Paris Fashion Week Men’s in June 2019. This follows in the footsteps of Revolver, whose Scandinavian Manifesto showcase launched in June 2018 as an ongoing partnership with Pitti Uomo in Florence. The menswear scene’s return to elegance is starting to leave its mark even on sporty contenders such as Champion. Case in point: this mid-century collegiate-inspired tweed piece from the FW19 collab between Champion and bespoke streetwear brand Clothsurgeon. 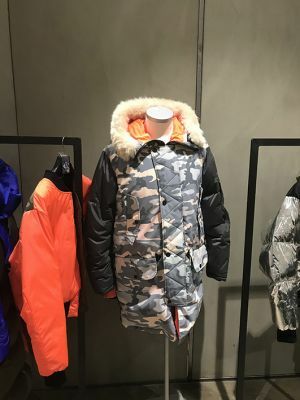 The Griffin X Woolrich collab, which is now in its third season, has become something of a favorite among the street-style set – the camo parkas made many appearances during the men’s week circuit in January ’19. This is good news, as the line Jeff Griffin has developed alongside Woolrich is rooted in sustainable thinking, giving new life to deadstock fabrics and using material derived from recycled fibers elsewhere. Ultra cool Australian label Ex Infinitas’ oversized denim pieces caught our eye as we wandered the Raven section. These voluminous jeans with generous turn-ups hung next to a matching jacket cut to an equally overblown silhouette. Another Raven highlight, London-based label Cottweiler presented its FW19 Reebok sneaker collab – including the model seen here, plus a “sloafer” in the same colorway, though Cottweiler prefers to describe it as a driving shoe. Antwerp-based sunglasses/watch brand Komono is celebrating its 10th anniversary in 2019. Its affordable line of sunglasses is a trend-led affair, and for FW19, a series of reflective models add edge to the collection. British brand Monkee Genes continues to improve its eco credentials. Its GOTS-certified Organic Flex denim is made from organic cotton and recycled polyester, while most water-free washes are done using laser techniques. As for fits, a new men’s addition for FW19 is this workwear-inspired jean, generously cut and with plenty of pockets.